Horace Mann School maintains a LEED-Certified Gold outdoor education facility in Washington, Connecticut. For more information about sustainability at the John Dorr Nature Lab, click here. The School has moved to the use of green cleaning supplies when and where appropriate. The School opts for the installation of energy efficient mechanical systems when upgrades are necessary. 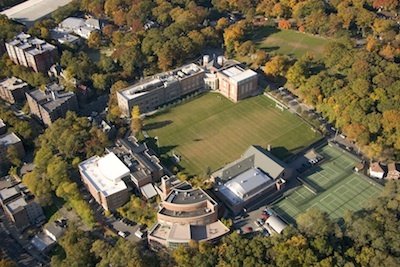 The School maintains environmentally friendly lawn and field maintenance practices. The School chooses to use low-VOC and water-based paints to reduce toxins and land-fill, ground water and ozone depleting contaminants. The School is in the process of installing hands-free faucets in all bathrooms on campus resulting in a potential savings of 500,000 gallons of water each year. The School will be installing 40 waterless urinals this spring. Each urinal is estimated to save 40,000 gallons of water per year for a total of 1,600,000 gallons per year. In Prettyman and Hazen Gymnasiums, the outdated energy-siphoning sky lights were replaced with energy efficient Kalwall units resulting in a heating and cooling savings to be determined.